I accidentally took a week off my beer reviews! I can't believe I missed a week... that never happens. Well I'm back on the beer wagon and back into the weekly #beersaturday beer reviews. I wasn't planning on taking a few days off posting on Steemit or making DTube videos but the week got the best of me and I ran out of time. This week I'm drinking an English bitter, which isn't something that I have often at all. It's from a larger brewer rather than my usual craft brews so I approached this beer with a little scepticism. I am a fan of English bitters though, so I was eager to try this beer. Especially when they describe this beer as being brewed with both pale ale and chocolate malts. This really does sound like an interesting brew. The beer has also won a number of awards. So along with that rather attractive description, I was expecting a pretty decent beer. The beer does indeed pour a lovely deep red and it pours with a strong off white head that lingers for a decent amount of time. There are strong notes of malts in the aroma and some notes of chocolate. The beer is reasonably carbonated, a little on the mild side. On the palate your be hit with a strong bitterness and strong flavours of malts. There is little in the way of hops to taste in this beer. The flavours don't really linger, and I found the beer vanished quite quickly, despite it being a beer of the heavier variety. 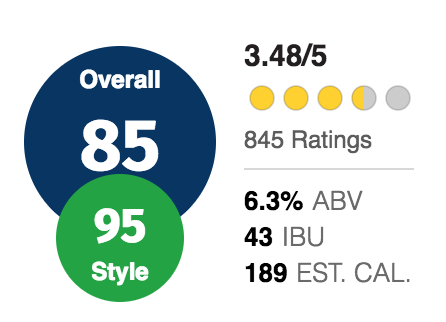 Ratebeer.com gives a fairly positive score for this beer, which I tend to agree with. My only real criticism is that the brewers claimed this beer to have flavours of Christmas cake and made the beer sound like we should expect something like the Christmas themed beers that we see during the holiday season. All I detected were the simple flavours such as bitterness, malts and chocolate. But overall, this was a good beer, and well worth your time. I'd love to hear your thoughts in the comments if you've had this beer as well. Oh! I'm back! I was out of steemit for a little bit! This looks like a dense beer, I couldn't drink it on empty stomach, that's for sure. It's good to see you back! Get on to writing your beer review. Ah. I need to get back to a good old big spliff. Nom nom nom another awesome beer! Here is to Lying, Cheating, and Stealing! If your going to lie.. lie for a friend! If your going to cheat.. cheat death! And if your going to steal.. steal a heart!! I love that toast! And I'm glad my beer review is the first you've found. I enjoy making them (and not just for the excuse to drink beer). Congratulations! This post has been upvoted from the communal account, @minnowsupport, by mazzle from the Minnow Support Project. It's a witness project run by aggroed, ausbitbank, teamsteem, theprophet0, someguy123, neoxian, followbtcnews, and netuoso. The goal is to help Steemit grow by supporting Minnows. Please find us at the Peace, Abundance, and Liberty Network (PALnet) Discord Channel. It's a completely public and open space to all members of the Steemit community who voluntarily choose to be there. Broadside, sounds like a blast!! Love the color, it looks amazing.